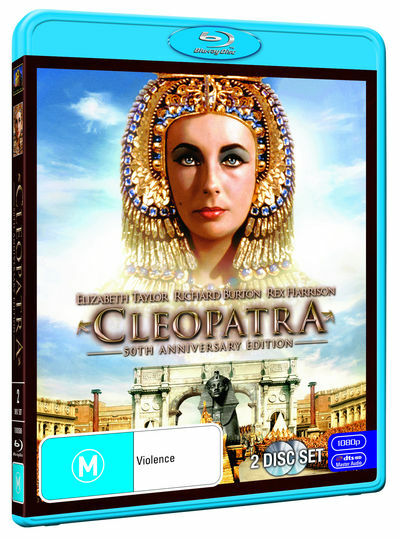 Elizabeth Taylor, Richard Burton and Rex Harrison star in this sweeping tale of power and betrayal – the legendary story of the Queen of the Nile and her conquest of Julius Caesar and Mark Antony. Here is the truly unforgettable portrayal of the beguiling beauty who seduced two of Rome’s greatest soldiers and changed the course of history. Breathtaking in scope and grandeur, the picture won Oscars® for cinematography, art direction, costumes and special effects In the tradition of epic romantic adventures like Braveheart and Titanic comes the greatest spectacle of all…Cleopatra.